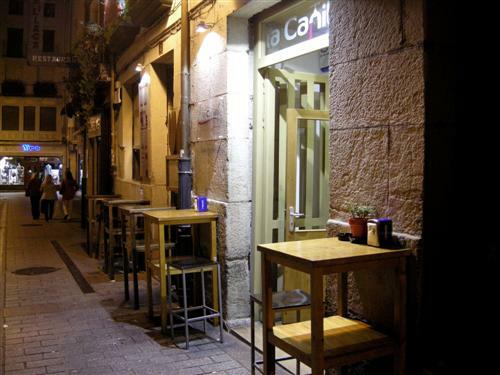 There is a fab new trend hitting pincho bars in Logroño! I’m in foodie heaven! Instead of serving up a little portion of something yummy skewered on a slice of bread like many of the traditional pinchos around town, many of the newer gastro-bars offer small portions of really delicious dishes combined with a small side or two for around 3 to 5 euros. It’s like a mini meal! They come with a small basket with cutlery and bread of course. You can’t eat food in Spain without bread, it’s unheard of! You’ve already seen me talk about this fad with carrilleras de cerdo and solomillo a la brasa, just to name a few. A lot of these fancier, “deluxe” pinchos, if you will, are centered around a hunk of really nice meat. This week, my new fave is rib-eye steak with shoestring potatoes and green peppers (entrecot con patatas paja y pimientos verdes) served at Bar la Canilla, spitting distance from my apartment. Mouth watering and dangerous! The steak is cooked somewhere between rare and medium rare (al punto) and it’s amazing. Though if you like your meat not quite so red and bleeding, say something when you order. It’s seasoned with sea salt and combined with the crunchy thin potatoes and green peppers, it’s heavenly. They have an intimidatingly long wine list of Rioja locals to chose from, and for less than 4 euros for one of the best cuts of beef, you can’t beat it! This pincho seriously rocked my world, so good! Note: do not read your posts close to dinner time! That looks amazing, and just how I like my entrecot. The sea salt sounds pretty tasty, too. I’m taking note of this one, looks and sounds deliiiicius! Thanks for the tip!